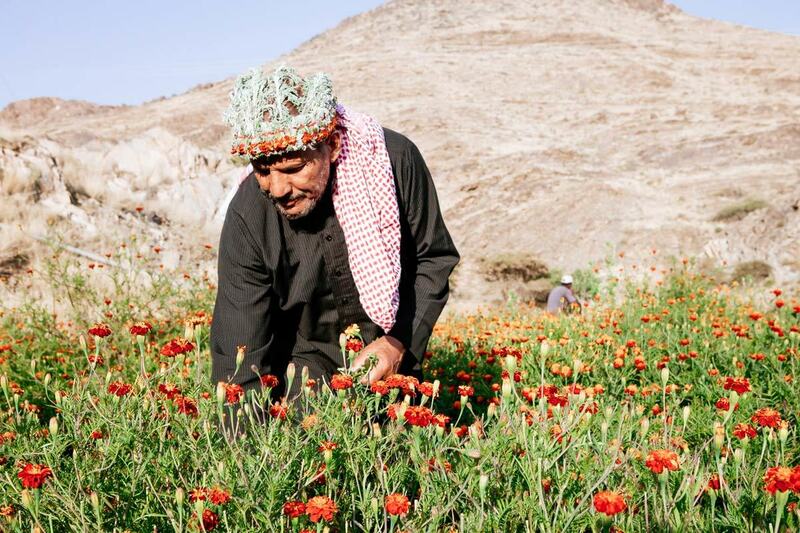 In the mountains of southern Saudi Arabia, men decorate their hair with flower garlands and sweet-smelling herbs. Jaber Mohammad closes the door and steps out from his house, on top of a small hill in the mountainous landscapes of Abha in southern Saudi Arabia. He walks down a slope leading to an open field just next to the house, which is hidden from sight at first. 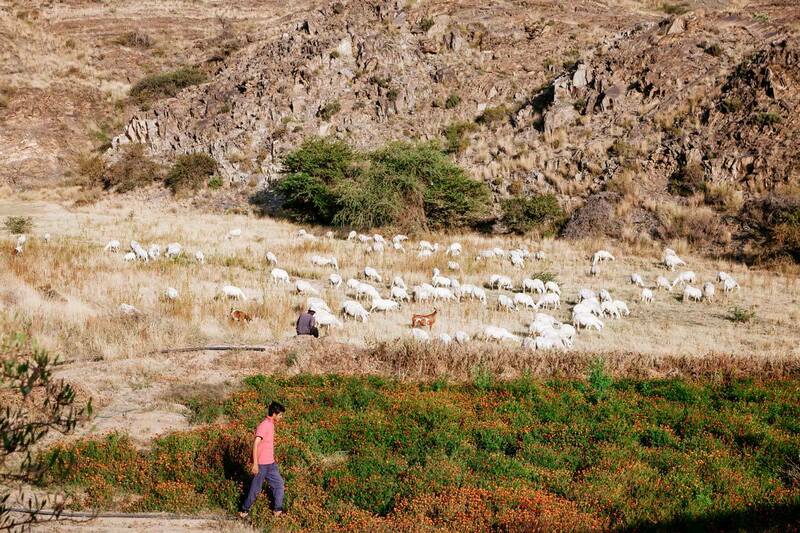 The field, as it emerges in front of him, is a stark contrast to the surrounding barren hills – it’s covered entirely in thick greenery and bright marigold flowers. 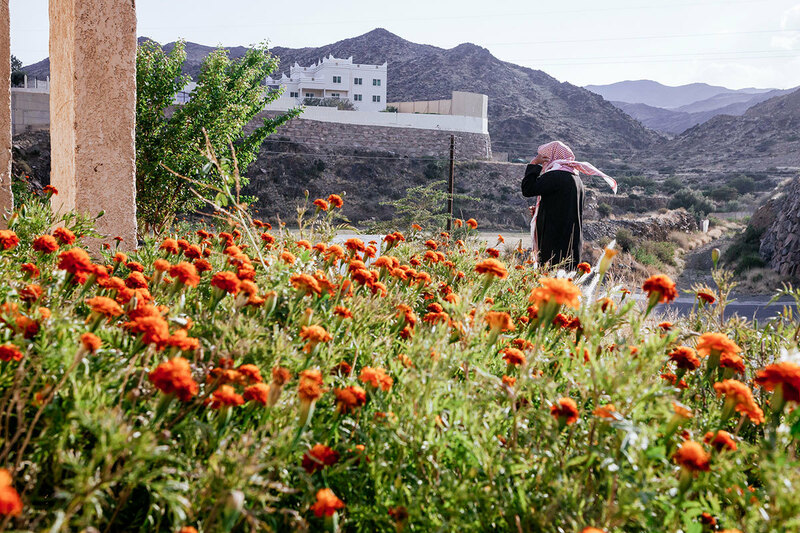 ‘We go down here early in the morning to pick flowers, before the kids go to school,’ says Mohammad. He walks into the field and starts picking the marigolds with one hand, holding them in the other. The flowers shift from strong yellow to shades of red and orange: collected in a bouquet, they seem to be on fire. Most days, Mohammad and his grandchildren pick several bags full. 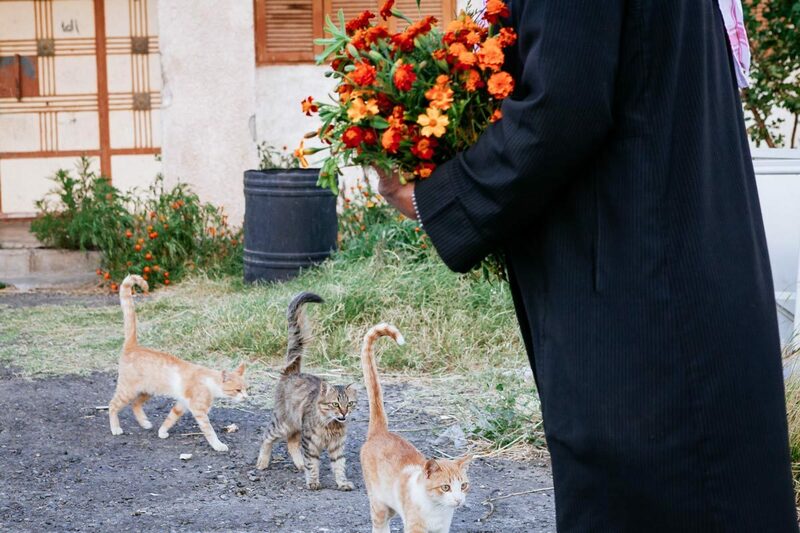 They then bring the flowers to local markets, where they sell them to people who bind them into garlands. They usually pick 10 bags and sell them for 25 Saudi riyals each. 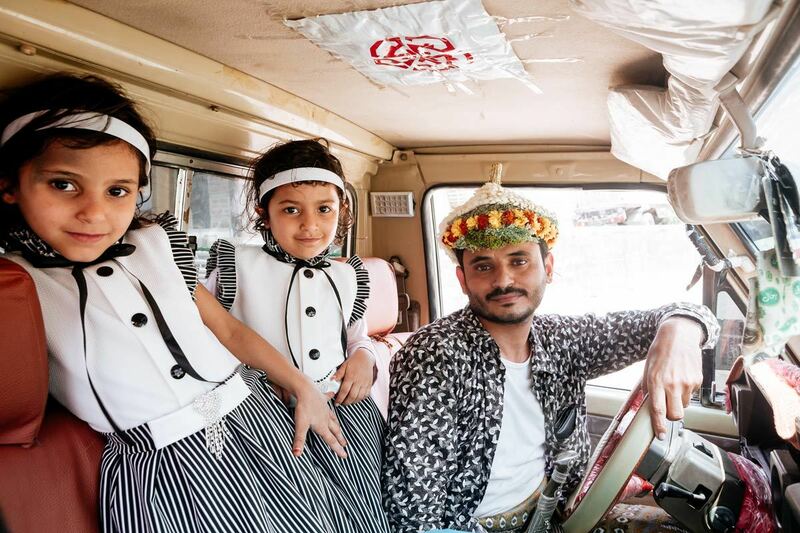 Wearing flower garlands is a long-standing tradition in this region, from the mountains around Abha down to the other side of the Yemeni border. Men and boys wear them around their heads, often with aromatic herbs tied in together with the flowers. 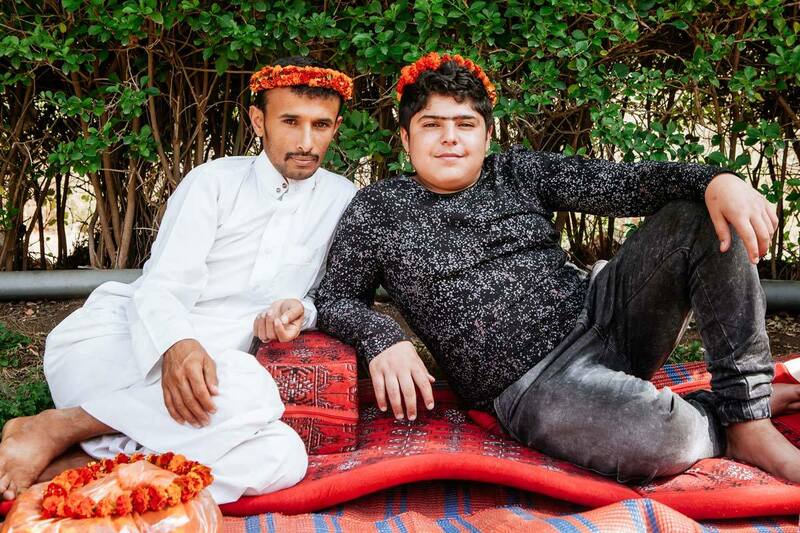 ‘We wear them to look beautiful, and because they give a nice and sweet smell,’ says Mohammad. It is still morning when he arrives at the market in Abha, together with his grandson Saoud Yahya. The large weekly market is held on Tuesdays, but the souq stays open throughout the week. The flower binders, a handful of women with stalls right at the entrance, come every day. ‘I have worked here for many years, longer than I can remember. 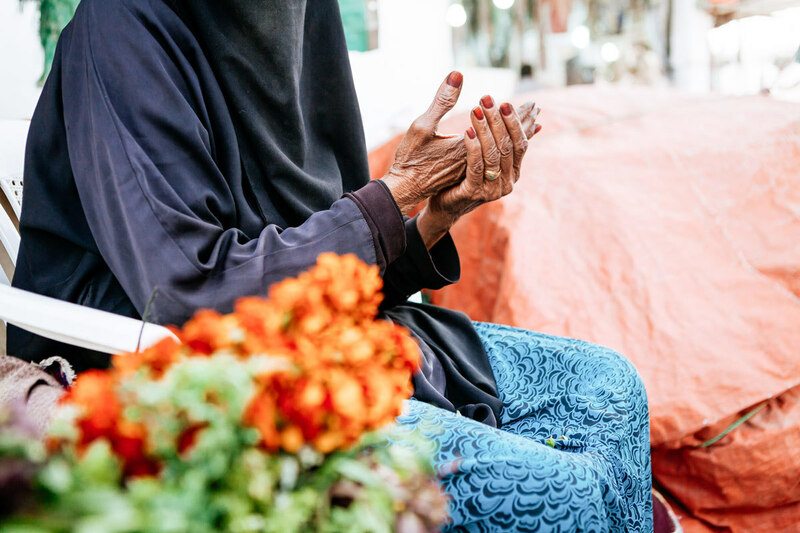 This is what I always did,’ says Umm Hussein, who sits on a chair behind a small table laden with flowers and herbs. She picks up the marigolds one by one and, with a long plastic thread, ties them together. Some garlands are simple, made from only flower buds in different colours; others are elaborate, with both green herbs and blossoms. ‘We use basil, dill, thyme. 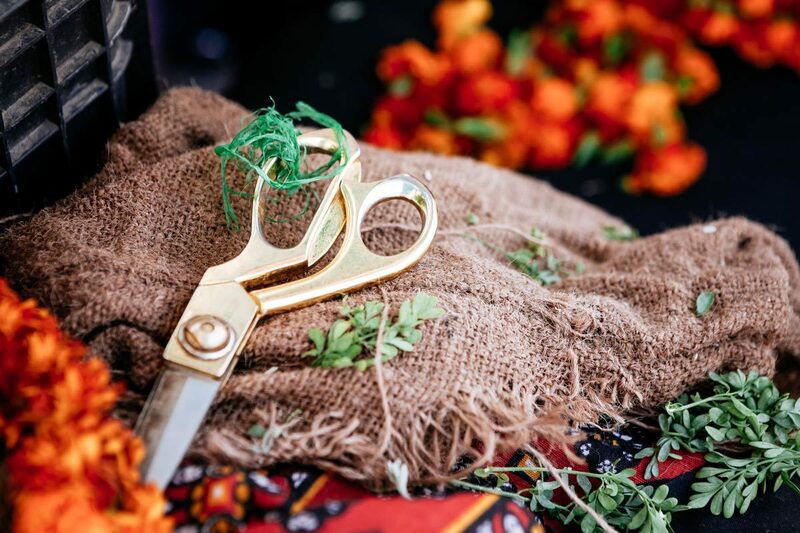 And this is baithran,’ says Umm Ali, another flower binder, pointing to the soft leaves of silvery artemisia interspersed with marigold on the garland she’s working on. The Abha souk is one of many similar markets – in Saudi Arabia, each town or region traditionally organises one on a particular day. Khamis Mushait, Abha’s nearest city, took its name from the weekly market held there each Thursday, for which the Arabic word is ‘khamis’. ‘Most days when we’re done in the field we go to different markets in the area, to sell our flowers to binders there,’ says Mohammad. 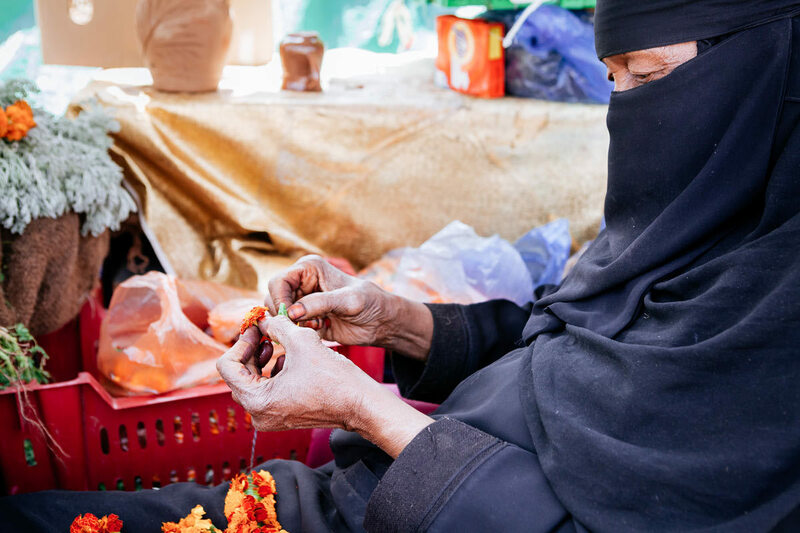 A few hours’ drive down the southern mountains from Abha is the town of Al Dayer, where a market draws people from the entire area. Just at the entry, next to the main road, a few pickup trucks have parked. 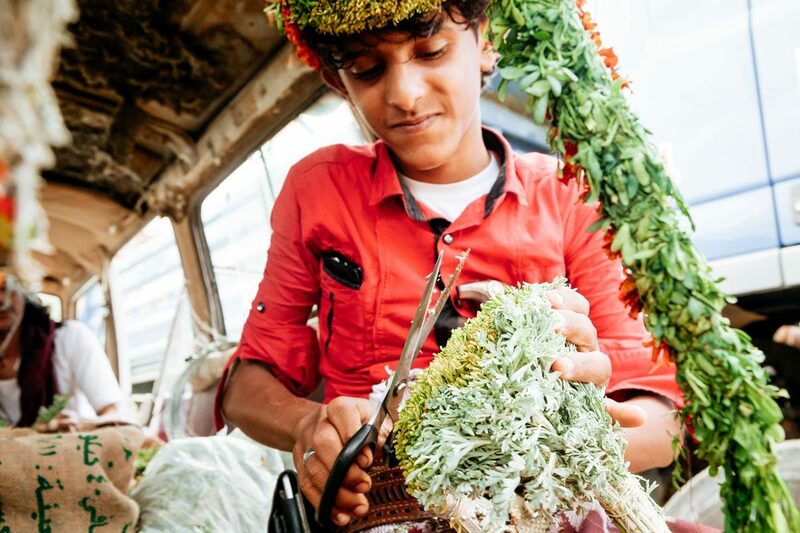 In the back of one of them, surrounded by flowers and bundles of herbs, sits Hassan Abu Ali. 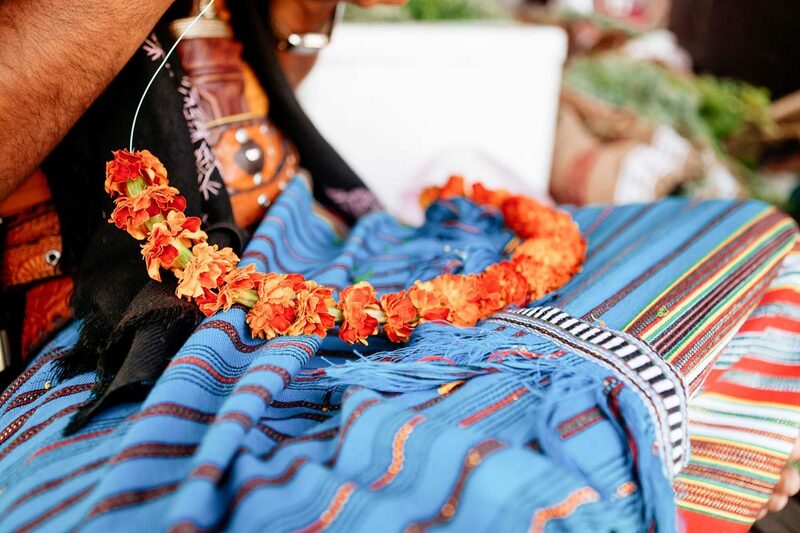 He wears a wreath on his head and a janbiya, around his waist – both part of the traditional outfit in this part of Saudi Arabia. 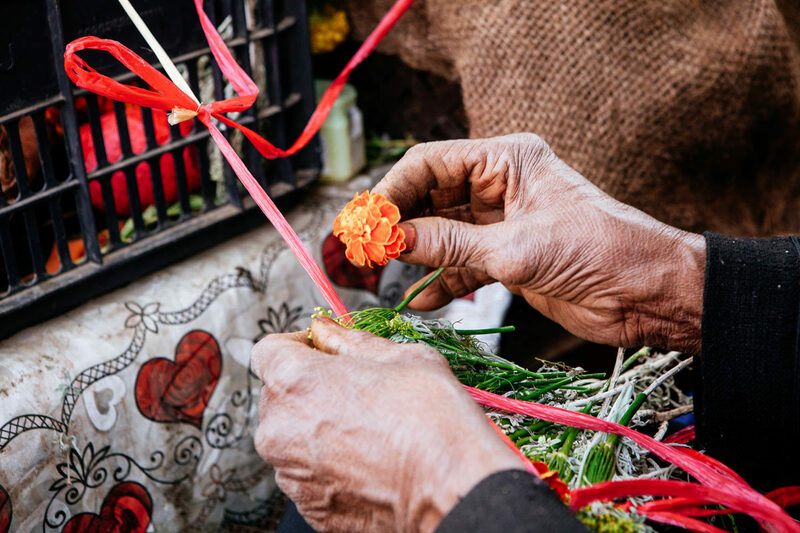 ‘We usually make 40 or so garlands per day, if there isn’t a festival or a special occasion – then we make a lot more. 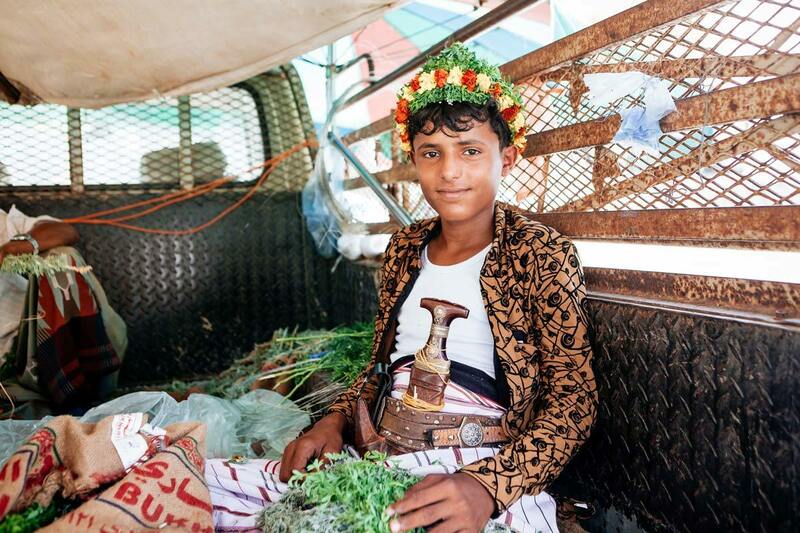 People come here in the mornings to buy a garland, then they wear it throughout the day,’ says Abu Ali. 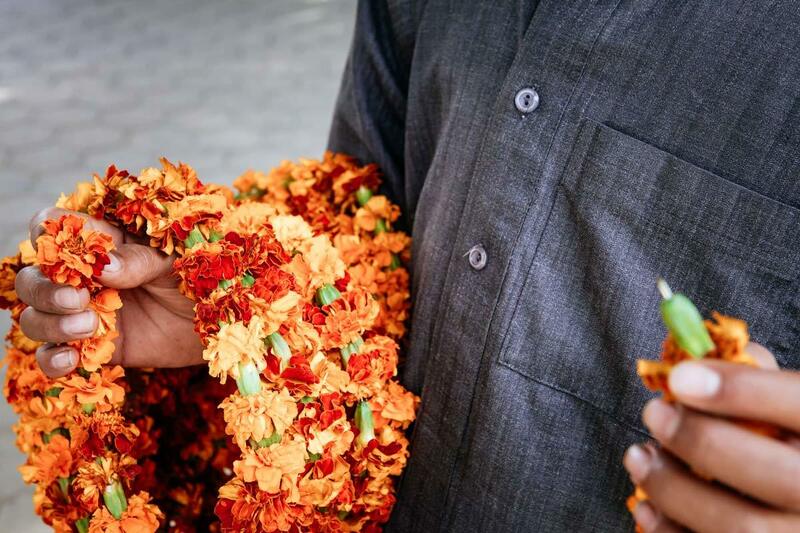 Next to him in the back of the truck sit three others – friends and relatives, all in the midst of binding garlands. Some of them look like those with marigold in Abha; others have thick bundles of herbs tied together, to be worn on the front of the head. Now and then, a passing car stops by. People step out and try on different wreaths before selecting which to buy. A father buys a garland for himself and one for each of his kids. A policeman from a nearby town – wearing aviator sunglasses and a long white thobe – selects another to put in his car. 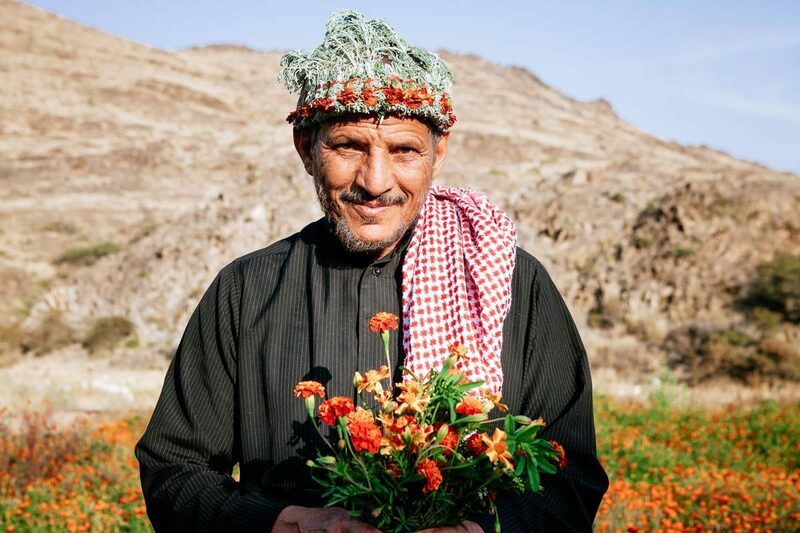 Growers like Mohammed bring the flowers fresh in the morning; larger plantations deliver blossoms that are kept in cold storage for several days. Besides wreaths, binders also make small aromatic bouquets to be placed in the bedroom, or herbal garlands used for their medicinal benefits – to cure a cold or relieve a headache. In the Abha market, flower binders also sell small boxes with henna powder, natural shampoo and large pots with herbs like basil or thyme. ‘I use thyme to make tea – it’s good for your health,’ says one customer as he walks around smelling the different plants, deciding on which one to buy. Umm Hussein, seated at her table, has almost finished the day’s work. A pile of garlands lies in front of her, made from golden marigold, artemisia and small stalks of dill. Her fingers work efficiently, tying flowers together with small knots. Next to her ear, kept securely in place by her scarf and niqab, is a small mobile phone. ‘I speak to my daughter, that’s how I spend my time working. Keeping the phone like this means I’m free to bind flowers. But yesterday I forgot the phone at home – that was hard,’ she says with a smile.